I know what you’re thinking after reading the title. Staying healthy at your desk job? How is that even possible? Well, I am going to tell you. I know it can be rather difficult to make good, healthy choices when you are stuck working at a desk all day. 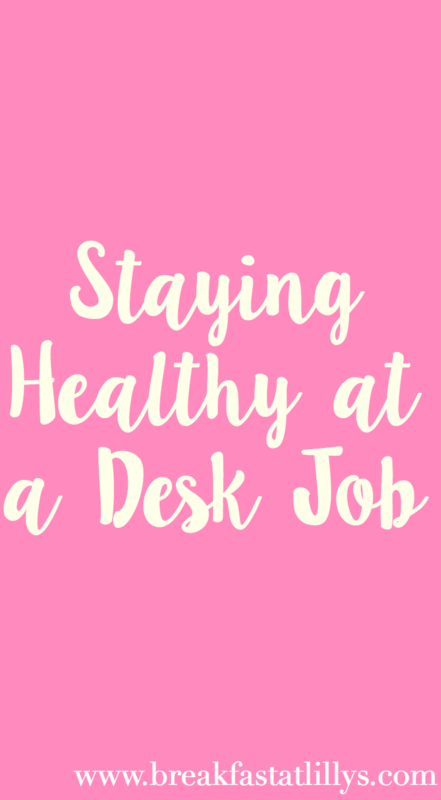 Believe me, I live that life from 8:30-5 every Monday through Friday but here are some tips to make sure that you are still staying healthy at your desk job while being mostly sedentary. Bring your own lunch to work – I bring my lunch Monday through Thursday and then allow myself to eat out on Friday’s during the week. This helps me refrain from choosing unhealthy choices at restaurants all week and also tremendously helps out my wallet because eating out every day can start to add up quickly. I also bring my own snacks like these Natural Balance Foods fruit and nut bars for either breakfast or sometimes even just for a midday snack. They are really filling and keep me from wanting to eat everything in sight which is an ongoing problem when people are constantly bringing junk food to share with the office. Get up and walk around every so often – This is not only good for your physical health but your mental health as well. To get up and move around ensures that your brain gets a rest from staring at a screen all day long and lets you get some extra steps in and get your blood circulating as well. I tend to get up and walk around about once every 60 to 90 minutes, sometimes more. Do some physical activity before or after work – I still struggle with this one because I feel like there just aren’t enough hours in the day but working out at least 2-3 times a week will help tremendous amounts. Just try to fit in a 30 minute or so workout in wherever you can. If you can’t seem to fit working out into your schedule, just do simple things like stretches at your desk or take the stairs instead of the elevator so that you are still incorporating some sort of exercise into each day and not being completely inactive. Avoid all the office treats – This one is another difficult one for me as I am a sucker for sweets but try to avoid these tasty treats and limit them to special occasions in the office such as holiday parties or birthdays if at all possible. How do you manage to continue staying healthy at your desk job? Let me know down in the comments.Disclaimer: Natural Balance Foods provided me with a free box of Fruit and Nut Bars in exchange for an honest review. All opinions are my own. Thanks for supporting brands that support Breakfast at Lilly’s.